In recent years, functional ceramics, a medium often shunted into the category of craft, has been accepted into the vast world of contemporary art. The February Ringling Underground features three artists living in Florida and exploring the medium of clay. 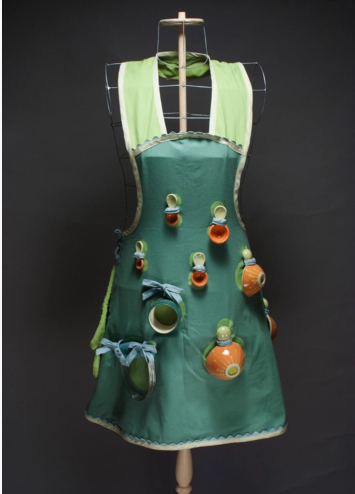 Jenn Ryan Miller, Sharon Norwood, and Cheyenne Rudolph use ceramics to explore various themes. Their diversity will provide the Ringling Underground audience with a multi-faceted view of contemporary ceramics being produced in Florida at current. 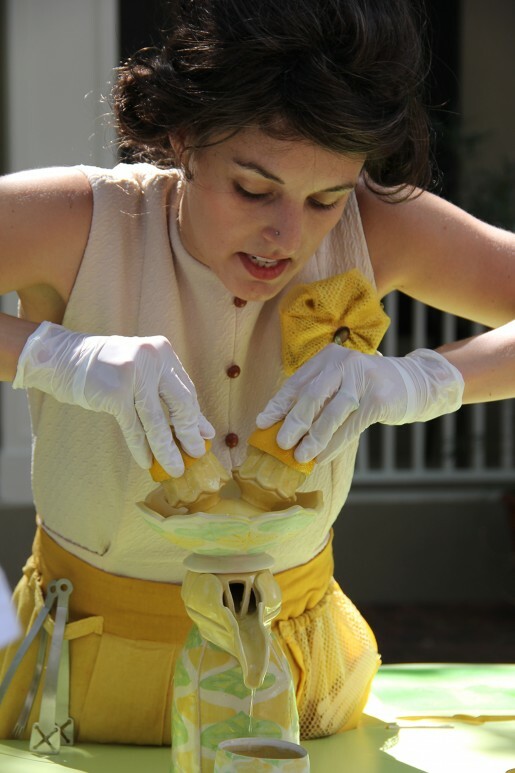 For the first installment of Ringling Underground on February 4, 2016, Cheyenne Rudolph will be performing Lemon-Aider. 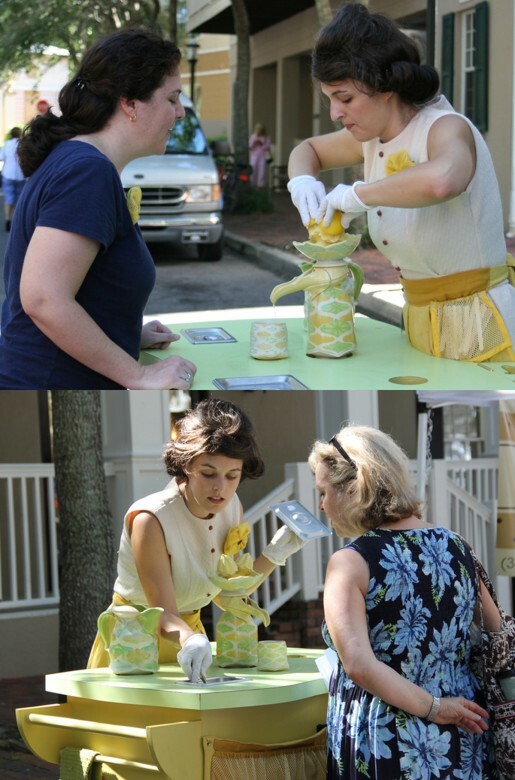 Cheyenne, who received her MFA in 2014 from University of Florida, is both a ceramicist and performance artist. 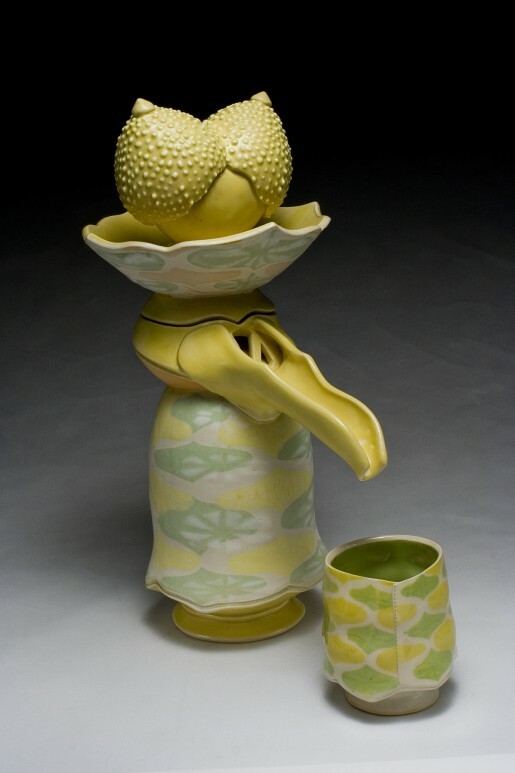 Her performances utilize subversive functional ceramics to explore childlike assumptions about domesticity and cultural expectations. Cheyenne graciously agreed to participate in an interview to provide the Ringling Underground audience with context about her performance, Lemon-Aider. Please describe the piece you will be performing at Ringling Underground on February 4. Why did you choose this piece to perform, and what are you hoping from the Ringling Underground audience in terms of participation? The Lemon-Aider is a friendly piece, highly approachable, and participants come away with a more intimate encounter. The piece is mobile and flexible in how I perform it, as I make lemonade from scratch for one individual at a time. It is more like a conversation with a character than a timed performance in front of a live studio audience. Participants may watch as I demonstrate, or they may interact with me as I make lemonade. When did you begin combining your ceramics with performance art? I have a background in theatre, studying it briefly in high school and undergraduate school. As the art objects I made became increasingly ambiguous and absurd in their functions, it was necessary to explain their use. The element of control is important in how I design the work, so it was natural for me to demonstrate, and to essentially take over the use of the objects, so that now, I am the only user. It has blossomed into an engaging way to design and make work. Where does a piece begin, the ceramics or the concept for the performance? Definitely the concept is primary. As I have learned to design for my own engagement, I am liberated from making pedestrian-friendly functional objects, so I think of them as actors or overstated props in the performance. I think about whether I will be performing live or through video, which helps in how I design the work. I also think about the installation and visual context of the piece; because it will be informed by its surroundings and my own interaction, the object no longer has to carry the full weight of the concept. I can, in a sense, magnify my visual concept to installation proportions, letting the backdrop, the video editing, or my own script, bring in subtext. I then make the object with my preliminary performance idea in mind. After the object is complete, the performance may go through a series of trials and refinements, and at times, I need to remake the object to better suit the performance needs. What is the relationship between the ceramics and the performance elements of your art? The objects instigate, or provide the implications of the performance, yet in their complicated design and retro aesthetic, they draw the viewer in. They are designed to be appealing, as is my own costume, yet while in use, they become a source of absurd subversion. I am picking apart and drawing attention to the expectations placed on me, personally, and on women of a particular type. What type of influences motivate your art practice? 1950s/1960s kitchen products, Chindogu and infomercials of the 90s/00s, parodies and satire, old SNL skits, calling attention to conventionally accepted, yet unjust paradigms. Lucille Ball, Amy Sedaris, drag performers, theatre scenic design techniques and methods. Ringling Underground is series of one night only events combining live music and experiential artworks in the Courtyard. The artwork is curated by Natalya Swanson and Shannon Fortner organizes the musical performances. Ringling Underground is always free for college students with a valid college ID. It is an extension of the Art After 5 program held on Thursdays after 5 p.m. After hours discounted admission is $10 for adults; $5 for children 6-17, children 5 and under and Museum Members are free. Cash bar provided by Modern Events at The Ringling. Ringling Underground is a rain or shine event.